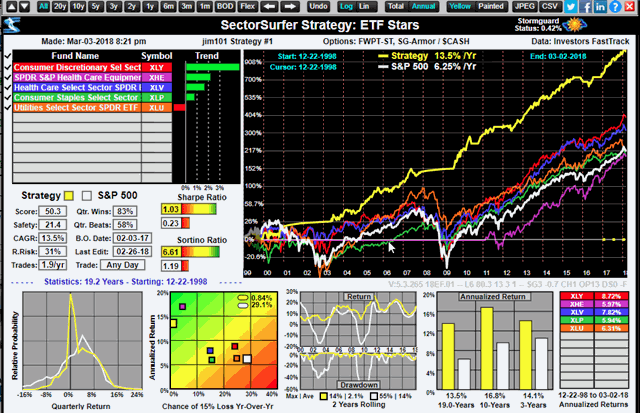 SectorSurfer focuses on sector rotation investing. The proprietary algorithms create strategies using sets of ETFs, Mutual Funds or stocks you specify. If you are limited to Mutual Funds in a retirement plan, this can be a godsend. SectorSurfer includes over 50 (free and fee-based) pre-built strategies applicable to specific savings and retirement plans (e.g., Alcoa, Apple, FedEx). Also, a great way to begin investing. 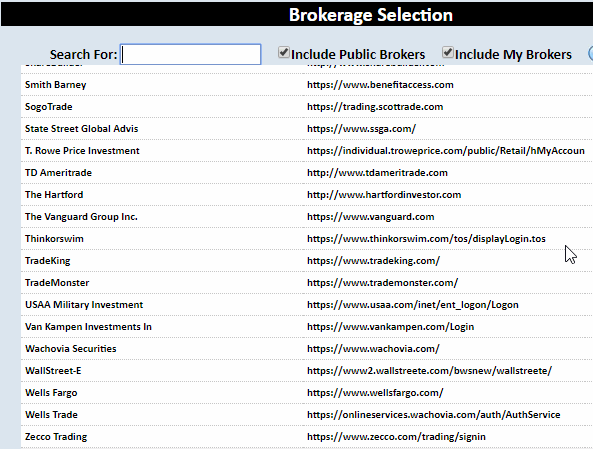 Also a great tool to add diverse strategies to your portfolio of investing strategies. NOTE: One risk of sector rotation investing is having all your eggs in one basket. Even worse, only having one egg. The core assumption is that at any point in time, some sector is out-performing. The key to success is to identify and invest in the out-performing sector. Rotation investing is not limited to sectors, but is generally expanded to include industries, market cap/style and even baskets of stocks. Wikipedia has a summary of sector rotation. Any investing tool that is not completely transparent is referred to as a black box - even if only a portion of it is unknown. For example, if you subscribe to a market timing service, you may have no idea of the basis of the timing signals. It is a black box which provides information on market status. SectorSurfer qualifies as a blackbox tool. But, unlike products which simply provide a list of possible investing opportunities, SectorSurfer allows you the freedom to choose the ETFs to consider and allows you to modify some of the parameters driving the algorithm. Only the algorithms are proprietary. Since this is a blackbox style investing tool, the checklist for fundamental stock screeners is not entirely applicable. It does, however, offer a variety of ETF and Mutual Fund rotation strategies which you can use at no charge. And any strategies you create can be saved by name - either in the sandbox (test area) or as a live strategy. One feature that sets SectorSurfer apart from many other blackbox tools is the ability of users to modify algorithm parameters and specify how best to deal with bear market situations. Clicking on the question marks pops-up a description of the associated option. 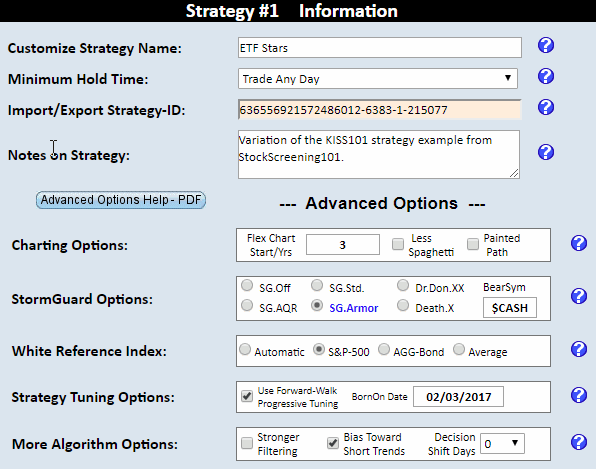 Any strategy you are testing or using has a complete trade history created during the simulation. Documentation is both excellent and extensive. The rationale for sector rotation strategies is a must read. SectorSurfer includes both nice-to-have and advanced features. Screen performance is tracked both in back-testing and for live strategies, and the trade history can be downloaded. For live strategies, this will be a history of the trade signals, not the date on which you acknowledged or actually used the signal. An exception is if you use the online broker option - in that case the actual trade date will be listed. In order to implement a rotation strategy, a list of up to 12 ETFs, Mutual Funds or stocks are identified. This custom universe is then managed by the proprietary algorithms and the algorithms identify the single best choice from the universe. In the chart above, XLY would be the current best choice of the 5 ETFs. How-to videos are available as are webinars. The webinars generally deal with current market conditions and market related topics. Finally, and perhaps most importantly, each time one of your live strategies generates a trade signal, you get a notification email. Just like the market itself, past performance is no guarantee of future results. Registration is free and provides access to a pre-built ETF and Mutual Fund strategies (currently there are no free stock based strategies). Notice the checkbox for 401(k), 403, 457 and 529 plans. Some of these are also free. Free is a nice way to start. And continue. 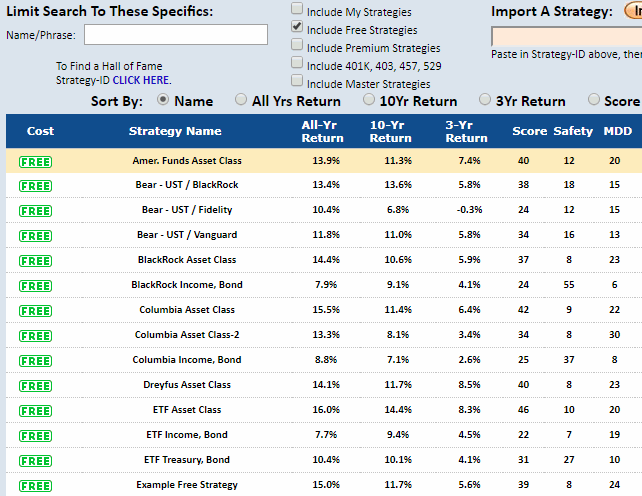 I still use the ETF Asset Class and the ETF Treasury Bond strategies as live strategies. So one thing you can do is choose a free ETF or Mutual Fund strategy and make it live - even if you don't actually invest in the recommendation. This gets you email trade alerts and a feel for the system. Next, spend some time in the Sandbox modifying an existing strategy or creating one from scratch. This is still free but you get no up to date trade signals. An option in strategy development, is StormGuard. 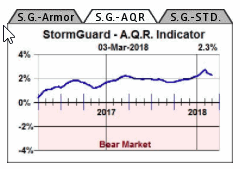 Stormguard is designed to protect your strategy during market storms (Bear Markets). Three variations are available to adjust the storm detection algorithm. As shown on the right, StormGuard - AQR would not have forced market based adjustments for the past 2 years. Dropping into the red zone would be an indication of a bear market and would have moved your strategy to the bear market position you specified. The sandbox allows you to select the instruments (up to 12) for the strategy and try the different options. You can see some of the symbols in the sandbox list below. Notice a sector rotation strategy (#32), a strategy based on the MorningStar style box (#33) for various market caps/styles, and an index investing strategy (#34). VTI/CASH (#34), because of the design of SectorSurfer, includes market timing. In this case, it would go to cash if the StormGuard algorithm detects adverse market conditions. Otherwise, it would be invested in VTI. Once the strategy you develop meets your personal requirements (e.g., risk, return, trades/year), turn it into a live strategy. SectorSurfer recognizes the trading restrictions on Mutual Funds and generates trade signals accordingly. There is no requirement that you invest in a live strategy, you can simply forward test. Or you could fund a FolioInvesting folio, make the recommended trades and track the actual performance as StockScreening101 does for KISS 101. If the trading frequency of your strategy is low (you have control of that), you could simply trade in your online brokerage account or your savings/retirement plan with a small portion of your available cash. This is an excellent product. It has value as a place to begin personal investing and as a place to diversify the strategies you implement. It has value as a guide to managing savings and retirement plans. Since there are free strategies and there is no charge for playing in the sandbox, it is worth trying.